Markets were under selling pressure and fell the most in more than two weeks. The central bank signalled that it may increase rates to control inflation at its meeting next month added to the worry. Selling in banking and technology shares weighed on the markets. On the other hand, the broader indices continued to outperform the frontliners, with the BSE Midcap Index up 0.47% and Smallcap up 0.78%. Overall, it was a rangebound session amid volatile trade. Wipro, Hindalco, Bharti Airtel, ITC, M&M and Kotak Mahindra Bank were the top losers, down 1-2%. Cairn India was the leading dragger on the Nifty, falling about 3.87%. Realty was showing outstanding performance today, rising nearly 3%. Ackruti City, Anant Raj Inds, DLF, Godrej Prop, Indiabulls Real, Mahindra Life, Orbit Corp, Parsvnath, Peninsula Land and Phoenix Mills rallied 1-4%. Unitech shot up 5.76% and HDIL surged 7%. In Midcap space, Jai Corp surged 12.5%. Wockhardt, Stride Arcolab, SpiceJet and Polaris gained 8-10%. However, Himadri Chemical, Fresenius Kabi, OnMobile Global, Allcargo Global and Eicher Motors lost 2.5-4%. In Smallcap space, Shri Lakshmi jumped 14%. Heritage Foods, ITI, Shasun Pharma and Reliance Industrial Infra were up 8-9%. However, Gravita India, Lloyds Metals, R M Mohite, Henkel India and Ontrack Systems fell 5-9%. The Sensex started the session up by12 points at 19699 tracking unsupportive Asian cues. In early trade, the index extended gains and hit the day?s high of 19811. After hitting higher level, the Sensex erased gains owing to profit booking that pulled the index off 3-month highs to touch the day?s low of 19551 in the mid-morning trade. 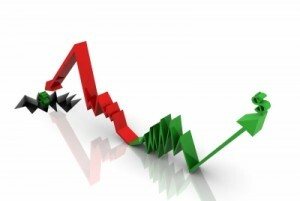 The Sensex remained in the negative terrain for the rest of the session. The Sensex fell 75 points to settle at 19612 and the Nifty closed below 5900 at 5892, down by 18 points. The market breadth was positive despite key indices closing in red. Of the 3,041 stocks on the BSE, 1,765 advanced while 1,165 declined. However, 111 stocks remained unchanged. The European markets edged higher in volatile trade on Wednesday, with banks recovering ground after Portugal managed a successful bond auction and Marks & Spencer Group PLC inspired retailers. The Asian indices ended on a mixed note on Wednesday. Japan's Nikkei fell to a one-week closing low, losing ground for a second straight day.